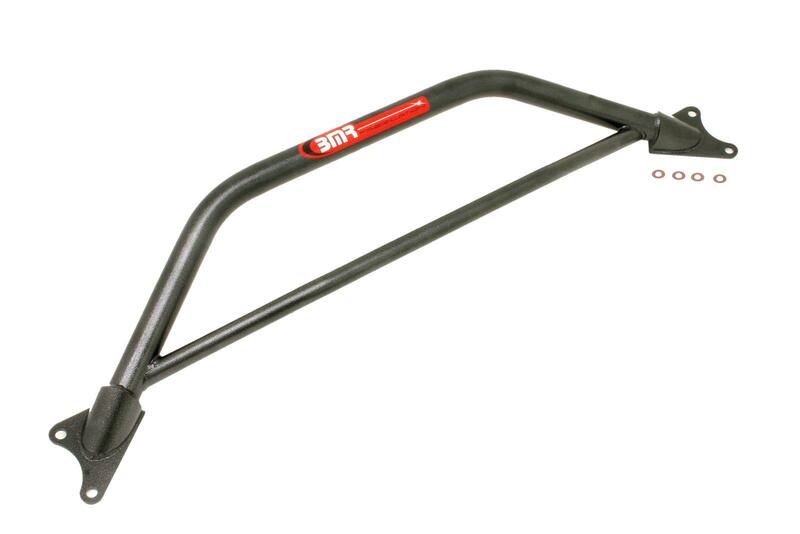 This 2-point Strut Tower Brace from BMR Suspension helps eliminate strut tower deflection under heavy cornering or load. The S197 generation of Mustang is FoMoCo's best handling live axle Mustang to date, but it could still be improved upon. Strut towers are subject to more load than most Drivers realize, and even just normal everyday driving can deflect the towers a measurable amount! Help alleviate the chassis flex problems that keep your Stang from being the best it can be with this 2-point strut tower brace. BMR strut tower braces are one of the most cost effective ways to improve handling on the the new Mustang platform. We build our braces out of heavy duty DOM tubing and use 3/16" laser cut mounting plates to keep tower deflection to a minimum. Simple 15 minute installation. Note: This system is designed for Naturally Aspirated Mustang models and does not fit models fitted with Roots Superchargers.